The Cross State Air Pollution Rule (CSAPR) is the U.S. Environmental Protect Agency's (EPA) latest attempt to regulate and control air pollutants; with their primary target being fossil fuel power plants. This nationwide rule is intended to restrict emission volume that would travel "downwind" and have a negative impact on neighboring states. The EPA is basing this strategy on reports that say cutting emissions will lead to better overall health and fewer premature deaths and reduce the amount spent on healthcare nationwide. At the end of August 2012, the "DC Circuit" (Court of Appeals for the District of Columbia Circuit) officially vacated the legislation because of conflict with the EPA's enforcement methods. Under the CSAPR, the utility companies within a state would be given allowances for a certain amount of emissions and exceeding these allowances would result in hefty penalties. On top of fines to the EPA, any utility found in violation would have their allowance for the next year reduced in proportion to how much they exceeded it by. The current standards the EPA has in place have already cleaned up our air and water but at a tremendous cost. The new standards being proposed would be extremely difficult to meet and monitor, and another layer of penalties for non-compliance is the last thing our struggling economy needs. 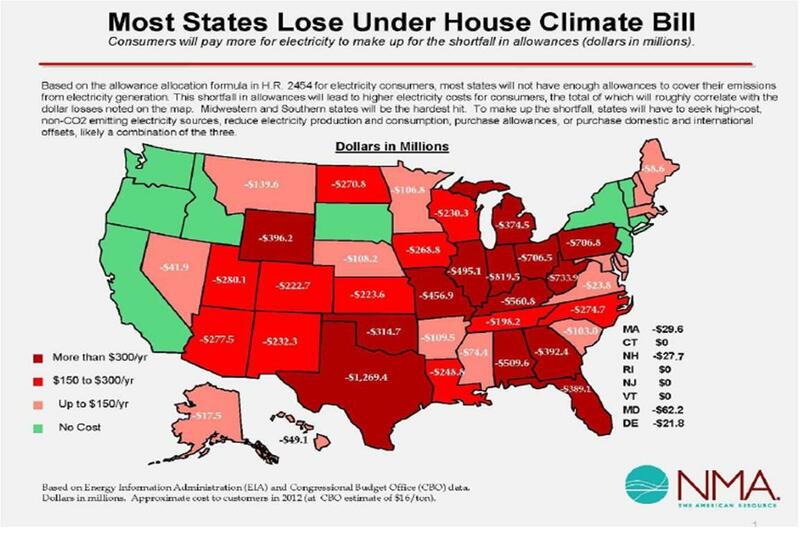 Shown below is a representation of dollars (in millions) that would have been lost by states under the American Clean Energy and Security act of 2009. That defeated Act would have created a cap and trade arrangement on utility emissions. That proposed legislation was similar to the CSAPR, and the State Map below shows what the economic impact would have been to achieve compliance. In recent months the CSAPR has met its share of opposition. The original implementation date of January 1, 2012 has come and gone. In August 2012, a 3-judge panel of the DC Circuit Court decided to vacate the CSAPR in its entirety by a vote of 2-1. We expect the EPA to appeal that decision and seek a ruling from the entire Court. The 3-judge panel sited the EPA as overstepping its authority on two counts. First, the EPA tried to impose unrealistic reduction requirements that went beyond what the rule actually called for. Second, once the EPA determined requirements for a state they began setting up their own implementation plans, without giving the states a chance to respond and meet requirements on their own. In effect, the states were expected to do too much in too short a time and had to do so on someone else's terms. For this reason, the DC circuit ruled (p.7) that the EPA had "departed from its consistent prior approach" and "violated the Act." With this rule vacated, the EPA will continue to enforce the CAIR (Clean Air Interstate Rule), the legislation that CSAPR was intended to replace.